By this point in the summer, the backyard garden is producing a bountiful crop of vine-ripen tomatoes. 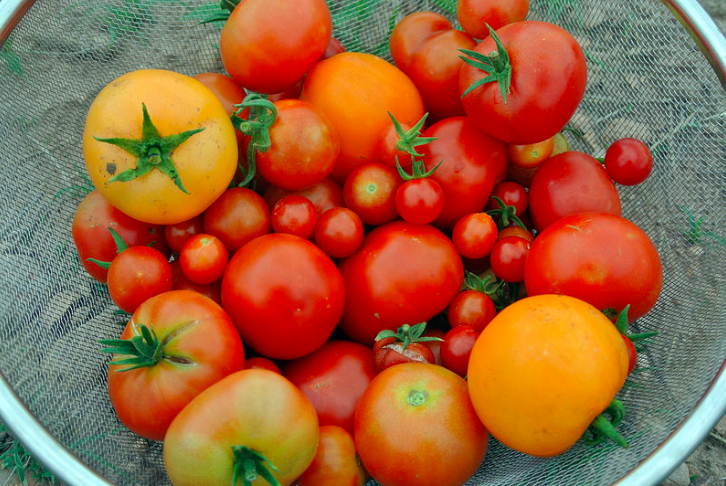 Leaving the gardener with quite a conundrum — What does one do with all those extra tomatoes? There’s only so many tomatoes that you can unload on a family member, loved one, or neighbor. Luckily, a few chefs have shared their favorite tomato recipes, designed to make the best use of this year’s bumper crop. These include a tomato bacon jam, tomato salad sandwich, pan con tomate, and watermelon and tomato skewers. Each of these recipes are easy enough to make at home, meaning it’s a quick option for the next dinner or cookout. Chef Heidi Vukov hails from Pennsylvania and runs a restaurant in Myrtle Beach, South Carolina, called Croissants Bistro & Bakery. She recently published a cookbook that highlights all the best in Low Country cooking, including a variety of tomato-based recipes. Then, there’s the master of the tomato, Chef José Andrés. Aside from his namesake fast casual chain Beefsteak, he’s also hosting a party in honor of the famed Spanish tomato festival, La Tomatina. Together these chefs have four recipes which can take the quintessential backyard tomato and turn it into an amazingly delicious dish. The Following recipes are from chef Heidi Vukov. Cut about 12 leaves of fresh basil and wash and set aside. Spread 4 slices of bread with goat cheese and make a sandwich. Spread the outsides of the sandwiches with butter. Grill both sides until golden brown. For Assembly: Place each sandwich on a plate. Stack four slices of tomato on top of each, then top with fresh basil. Drizzle lightly with olive oil and sprinkle with salt and pepper. Finish with a drizzle of balsamic vinegar. In a large saucepan on low heat, add the diced bacon and slowly cook the bacon until it is crispy. This will take a few minutes. Keep stirring the bacon occasionally and cook until the majority of the fat is cooked off. Carefully drain grease from pot. Then, add the diced tomatoes and thyme and cook for 5 minutes. Pour the sugar over the tomatoes and stir until dissolved. Add the red wine and red wine vinegar and simmer for 20 minutes. Finally, add the salt, pepper, and grenadine and cook for an additional 10 minutes or until the consistency of jam. Store in a sealed jar and refrigerate.